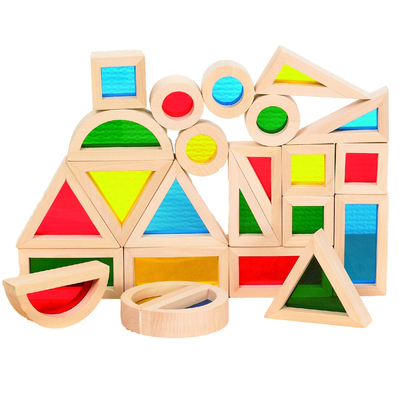 A great resource for energetic primary schools and nurseries, our Rainbow Block Sets are a colourful wonder to behold. Designed as part of our sensory collection, each block is manufactured from a hard wearing wooden frame with a range of transparent and coloured acrylic inserts. Encourage your pupils to hold the blocks up to their faces, use them with your existing lightboxes or simply show them how to build mesmerising castles - the opportunities are endless. This rainbow block pack are ideal for building on their comparison skills, shape recognition and colour mixing. For sensory play, we also have a large Giant Rainbox Block pack of 36 items and Light Panels available in both A3 and A2 sizes. We believe in supporting the development of all ages and are sure you'll find the ideal product right here for an exceptional wholesale price.